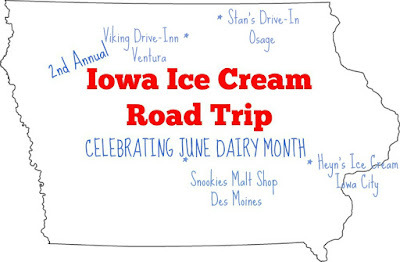 As June Dairy Month comes to an end, I thought I'd better share about my family's last two stops of our 2nd Annual Iowa Ice Cream Road Trip. The final stops are similar in many ways. They are both located in North Iowa where we live. They are both "drive ins". They are both open only seasonly during the summer. And they both serve soft serve ice cream. They are the Viking Drive-Inn in Ventura and Stan's Drive-In in Osage. The Viking Drive-Inn is located in the town of Ventura, which is located on the west side of Clear Lake. Did you know there are more than one town that Clear Lake goes through? We finally visited this local ice cream shop for the first time earlier this month and it lived up to its popular status. When arriving we had to park down the road and then once the kids and I got to the front door, we could barely open it up to get in, to order. Like I said, the place is very popular and on a nice, Saturday afternoon, the place was packed. Inside is room for six people to sit up at the bar, but there is lots of seating outside, where there are several picnic tables to sit at. If you are biking or driving around Clear Lake be sure to stop by this little ice cream shop. They also have a classic drive-inn food menu too if you're hungry for more than ice cream. 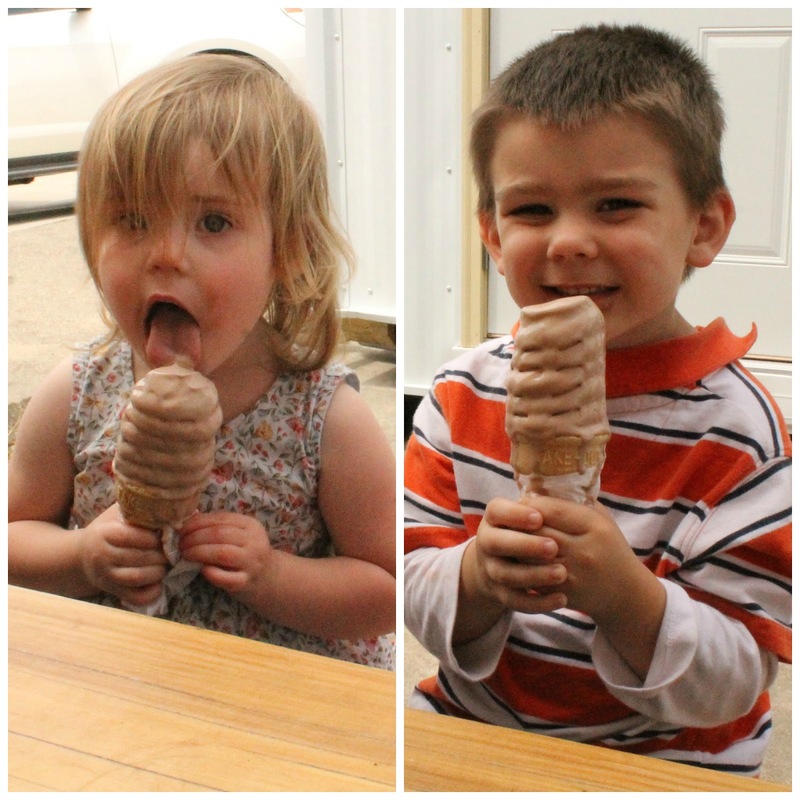 Stan's Drive-In in Osage is also another popular ice cream stop in North Iowa. This is a fun place to eat and have ice cream with your family with a little bit of nostalgia. I mean, how many drive-ins can you drive to today where you can have a car hop come to your car, take your order and deliver it to you in minutes? The first thing that really impressed me about Stan's was the speed of service. The place was packed of cars under the drive-in awning and back by the picnic table sitting area. No matter where you were, the two car hops got to everyone fast and friendly. Just like at our other ice cream destinations this summer, I asked the car hop what their most popular items were. She told me the chicken breast filet sandwich with their special sauce and their arctic delights (think DQ's blizzards). So that is what I went with. My chocolate cookie dough arctic delight was exactly what I was looking for. The soft serve ice cream was thick, rich and smooth. Have you been to either of these popular drive-ins in North Iowa? What's your favorite flavor of soft serve ice cream you've ever had? Remember to Comment for a Cause! 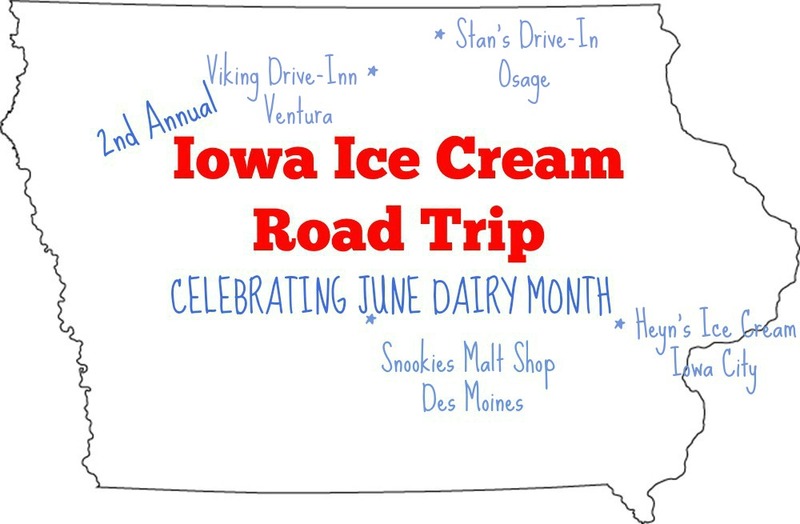 Also be sure to check out our other destinations this month to Snookies Malt Shop and Heyn's Ice Cream. I still need to make it there! Both are fun place to visit! Let me know when you want to go and we'll go with you! I've never been to either, but I love LP's backward shirt...so him!! 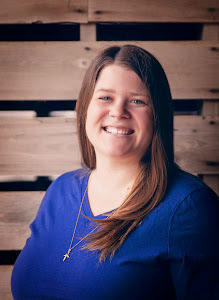 You should check out Dariette in Fort Dodge. They have walk up and drive up service, and they show movies sometimes during the summer. https://www.facebook.com/pages/Dariette/101728646555435 They have different flavors of the week. There's a lot of construction around there right now, but it's worth a visit. I like that you are taking your kids to see different places, so they can enjoy Iowa. I haven't done enough of that, and my kids are 19 and 21 now. I will add the Dariette to our list for next year! I've got several ideas already for the 3rd Annual Road Trip. Yum! Hoping to make a stop at Stan's this weekend! I'd like to go again and try something different. What is your go to there? Yum! I NEED to go on an ice cream road trip. Like, now! Have things settled down for you yet? I still have a secret scoop of ice cream hidden in the freezer, I should go get it! 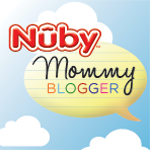 Glad you shared this post with us on the blog party! You need to Jan. Today is even National Ice Cream Day! I love that you do an annual ice cream tour! That's awesome.